New to season 19/20. 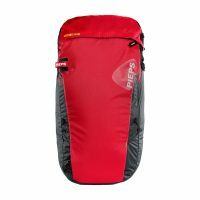 The Pieps Jetforce BT 25 Airbag has won awards for its easy handling and low-cost deployment that can be used repeatedly. 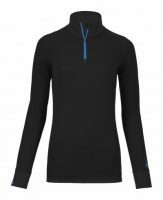 Jetforce is the result of the collaboration between Pieps and Black Diamond, two leading innovators in snow safety. 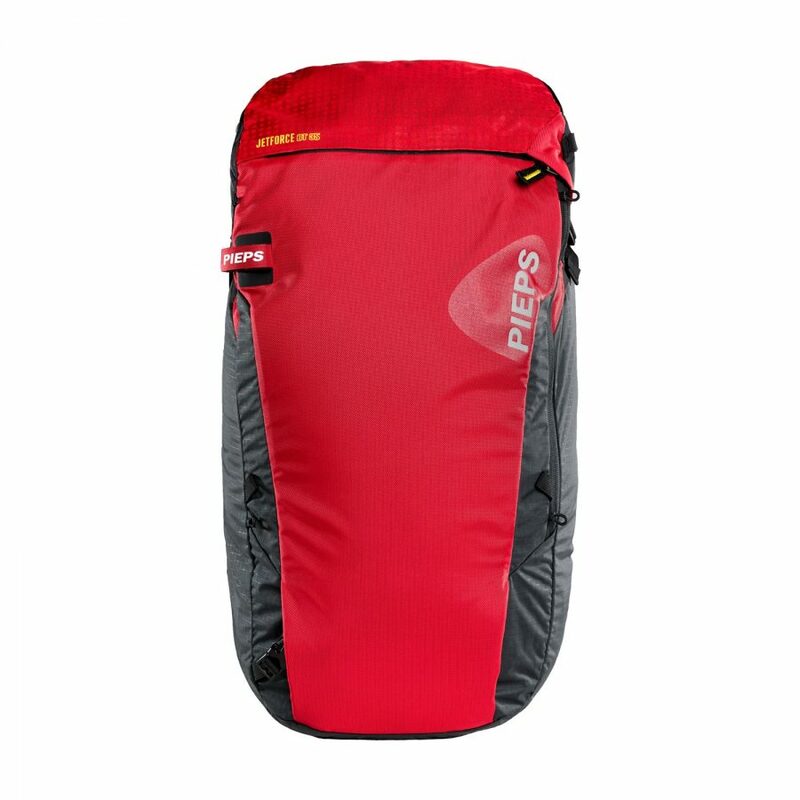 The Pieps Jetforce BT 25 Airbag provides you with a volume of up to 25 Litres to fit all the necessary gear you need on a backcountry tour. The BT 25 boasts ski and snowboard carry systems, a specific avy tools pocket, helmet holder and single ice-axe attachment for securing your gear. It also includes a glacier loop on the waistline belt to let you clip this pack to your harness during a crevasse rescue. The right size for any trip; from a 1-and-done lap to a full day of backcountry skiing, the Pieps JetForce BT 25 airbag carries your essentials and features a fan-inflated airbag for added safety. 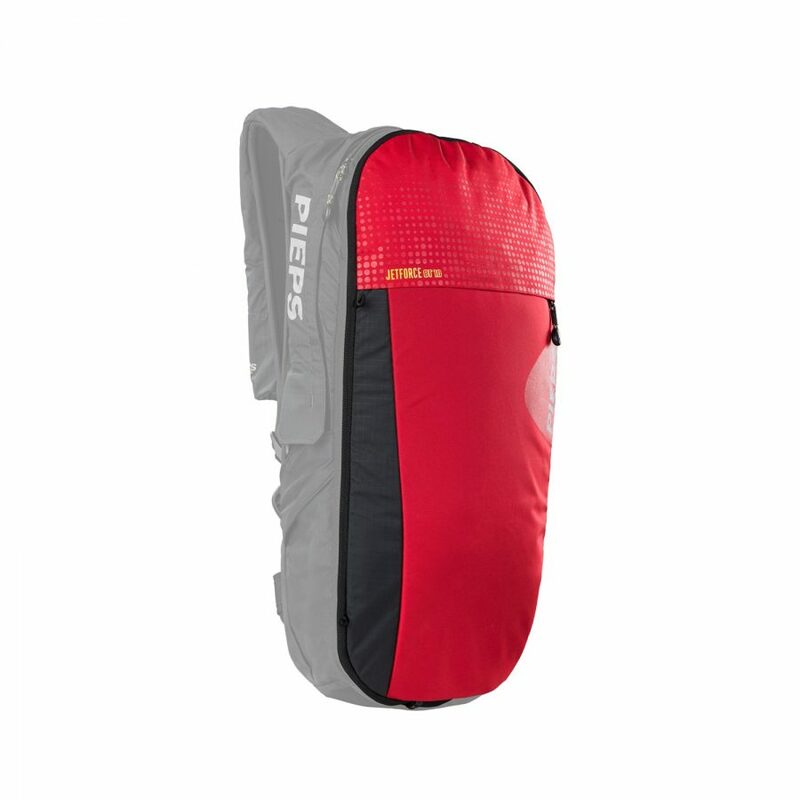 The Pieps Jetforce BT 25 Airbag provides an ample amount of internal space to store avalanche safety equipment. When wearing your Pieps Jetforce BT 25 Airbag make sure all straps securely fastened and the system is successfully armed with the LED is showing a pulsing green light. The airbag can now be deployed. 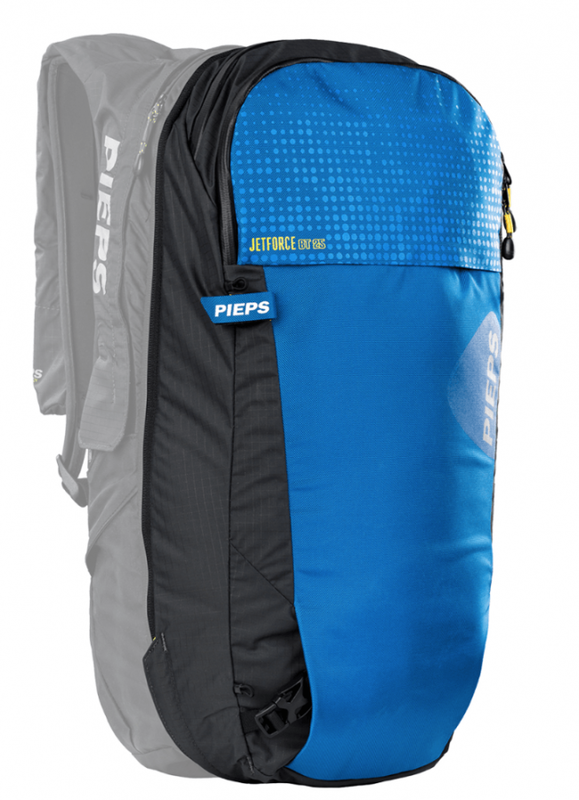 The Pieps Jetforce BT 35 Airbag easily stores all your essential gear Shovel, Probe and Accessories and in a dedicated avy tools section. The main compartment can be accessed from the back panel, making it accessible while carrying your ski's on the pack. Convenient accessories pocket within the avy tools section. Tuck-Away Diagonal Ski Carry (Airbag can be inflated even if skis are still attached to the bag). HiLo helmet holder carries equipment at your convenience without blocking the deployable Airbag. 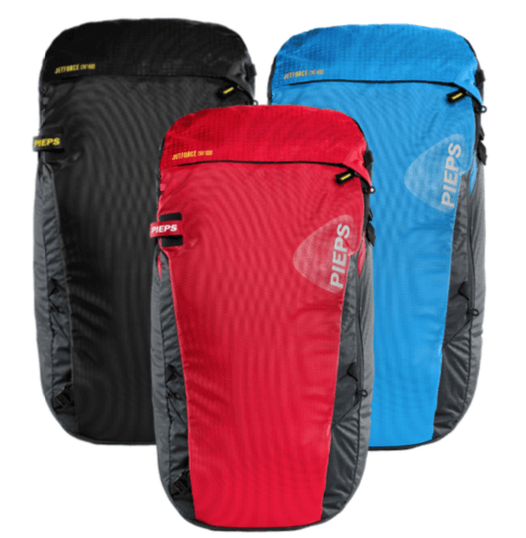 Compression Straps with non-icing PIEPS-buckles. Waistline pocket for easy-to-reach supplies or valuables. The Jetforce is the first Avalanche Safety technology to use jet-fan inflation. This is a breakthrough system that draws air from the unlimited source of the atmosphere. How fast does the bag inflate? 3.5 seconds for initial fill, which is as fast (or faster) than any cylinder system. Where does the air pull from? There are three locations that allow air to enter the fan. The primary is the intake port located on the lower left sidewall of the pack. The second is the entire backpanel of the pack is open cell reticulated foam that acts as both a filter and air intake. The third is through the mesh lining of the airbag pocket itself, after the airbag has been activated. Having three intake locations allows the system to get ample amounts of air despite any impediments like snow, clothing, or equipment. Will the airbag be able to deploy from within the snow? Through our experience with the AvaLung, we have done years of research to prove that the snow pack maintains large amounts of available air. 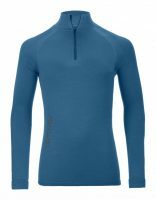 We have designed the system to pull air from many locations around the pack, thereby reducing the concern that any one of these spaces could be fully blocked. Also, the fan runs about 3 times longer than needed to actually fill the bag, thereby allowing for the reduced efficiency when fully buried. How fast is the fan? What type of battery is used? And is there a temperature effect on the battery? The JetForce battery is similar to the battery found in most laptop computers: a Lithium Ion. Our battery differs in one key aspect: it was engineered specifically to operate at very cold temperatures (-30C). The battery is sized to operate once at very cold temperatures even at the low end of charge levels. A fully depleted battery will need 8 hours for a full charge. As with all Lithium batteries, for the best battery life expectancy, we recommend the battery is maintained closer to full charge. 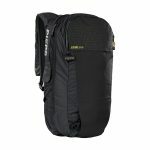 Is the Airbag mechanism interchangeable between Backpacks ? 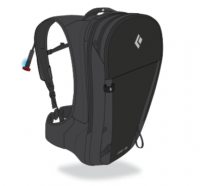 The jet force is built into the backpack and is not interchangeable like the ABS system. A fully charged battery can last up to six weeks depending on use. Can the system be turned off during deployment? Yes, but only by intentionally pressing the power switch for 4 secs and only after the mandatory initial inflation phase. Why does the JetForce system turn on and off during deployment? The system cycles through multiple phases throughout deployment. Each phase is specifically tuned to optimize safety and battery life. 0-9 secs: Mandatory Fill During the first 3.5 seconds, the airbag fills 100%. For the next 5.5 seconds, the system continues to run at full speed for safety redundancy. 10-60 secs: Active Slide Performance The system pulses between full speed and 50% speed. Since this is the most likely time to be carried by the avalanche, it is most critical to maintain full volume and recover from any possible tears. 61-180 secs: Volume Maintenance The system has 20s stand-by intervals between 3s full speed refilling pulses. The goal is to maintain the volume to aide in visibility and meet CE timing requirements. 181 sec: Active Deflation After 3 total minutes, the bag will automatically deflate. If partially or completely buried, this has the potential to create a large volume of air for breathing and/or extraction. If unburied, this simply helps repack the airbag quicker. All existing airbags only work well in ONE scenario- if you are actively churned by an avalanche. We wanted to create something that offered the potential for increased safety if the slide came down from above or if the victim got caught in a terrain trap. 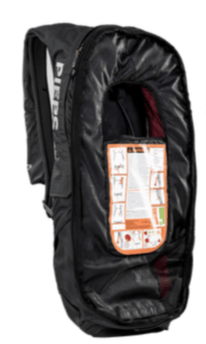 By deflating the airbag, JetForce has the potential to create a large air pocket in a complete burial scenario. By waiting until 3 minutes before deflation it allows the practicing user an opportunity to shut the system off before deflation in order to maintain battery life. 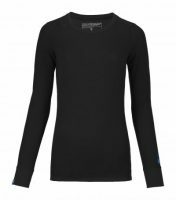 In the event of a full burial, the time allows for the snow to set-up firmly before creating a pocket. Why are you using a larger airbag? Maximize the effects of inverse segregation. All avalanche airbags work on the same principle, which states that in an avalanche, larger objects will tend to rise and smaller ones will tend towards the bottom. Increased impact protection. A larger area of balloon around your head and torso help to prevent impact. Maintaining effective volume. By starting with a larger volume, it is easier to maintain an effective volume despite punctures or tears. What effect does this system have on beacons? There is a very minimal amount of interference with beacons, but only when the fan is actually running and only within very short range. Why didn’t you incorporate the AvaLung? 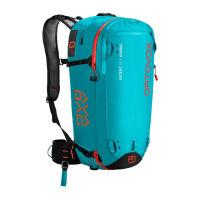 While we still feel that the AvaLung is a great technology and could certainly aide airbag users, we were more concerned that having two devices on the pack’s shoulder straps would only confuse an unpracticed user. If someone wants to have both, we already offer the AvaLung II sling, which can be used with any backpack. Also, the automatic deflation has the potential to create the same amount of breathable air as the AvaLung. What’s the status with field testing? We have been testing this system for the last 3 years (lab & field testing). Like all BD/Pieps product, before anything is made available to the public it will have undergone rigorous testing in the lab, then in the field with in-house users, and then is released to out-of-house professionals and athletes for more field use. Intensive out-of-house field testing phase will start in earnest this winter.